Mangaluru, Jan 29, 2019: A captive hippopotamus, at Pilikula Biological Park Vamanjur, has given birth to a baby for the first time in the park. The eight-year-old mother Kavita delivered the baby six days ago, according to H. Jayaprakash Bhandary, director of the park. Both are doing well, he stated. In all, three hippos, a male and two females, were brought to the park from Bannerghatta National Park in Bengaluru a year ago. If an animal breeds under captivity, it meant that the atmosphere in the park is conducive for breeding. 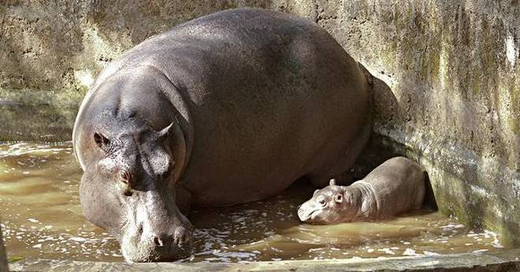 Now, hippos are the latest addition to the animals that have been breeding in captivity in the park which is one among the 14 major category zoos in the country. The park has obtained recognition from the Central Zoo Authority. The director said that visitors to the park can see Dhole or Indian wild dog (Cuon alpinus) in the display enclosure from today, Tuesday. In all, four Dholes brought to the park from Indira Gandhi Zoological Park, Visakhapatnam in Andhra Pradesh, a month ago under the animal exchange programme had been kept under quarantine so far. Dholes are on the verge of extinction now. The International Union for Conservation of Nature has listed them under “endangered” category. They are native to Central, South and South East Asia. They are social animals living in large clans. Once they were common in the Western and Eastern Ghats but now rarely seen. They ate deer, langurs, mouse, Indian hares, Muntjac and the like. When in clans, they can even bring down tigers. They hunt in the morning hours, he said. The park would bring bison, white tiger and striped hyena under animal exchange programme from other zoos this year, he said. The park has now installed closed circuit television cameras (CCTV) at eight locations to monitor tourist movement and check mischief such as teasing animals. Cameras would be installed in eight more locations shortly. In addition, it has been proposed to install CCTV cameras inside night shelters or animal houses to monitor feeding of animals. It will help in behavioural study. The Central Zoo Authority will have to give approval to the proposal if they were to be installed.